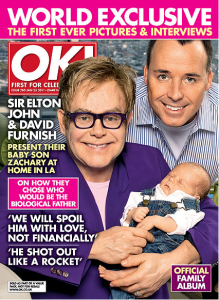 In a surprise announcement just before the New Year, Elton John and David Furnish revealed that they became fathers for the first time on Christmas Day. They are now showing off the new addition, baby Zachary Jackson Levon, on magazine covers in the US and UK in Us Weekly and OK! Magazine. Elton is getting ready to head out on a new tour on January 26th. The first date will be in France, and they have a staff ready to travel with them to help out with baby Zachary. Sounds like they have a busy time ahead for them, but the pair seem to have a handle on things!